Please Choose Length (Drop) 10" 11" 12" 13" 14" 15" 16" 17" 18"
Pair of (2) Black Window Valances! Choose Your Length, Rod Pocket Size, and Optional White Lining! Valances sold in pairs of (2) 40" wide valances for a total of 80" in width. Valances constructed of easy care Polyester/Cotton fabric. Valances with 1.5" or 3" pocket for rod and 1.5" header above the rod. Straight edge bottom, with or without optional easy care white polyester/cotton washable lining. Choose from several lengths from the shortest 10" all the way up to 18"! Made to order, BUT, no special sizes or requests, other than offered. Please allow 1-2 weeks plus transit time. GREAT things take time. NO exceptions. These are wonderful vintage style valances that will brighten and soften any room! 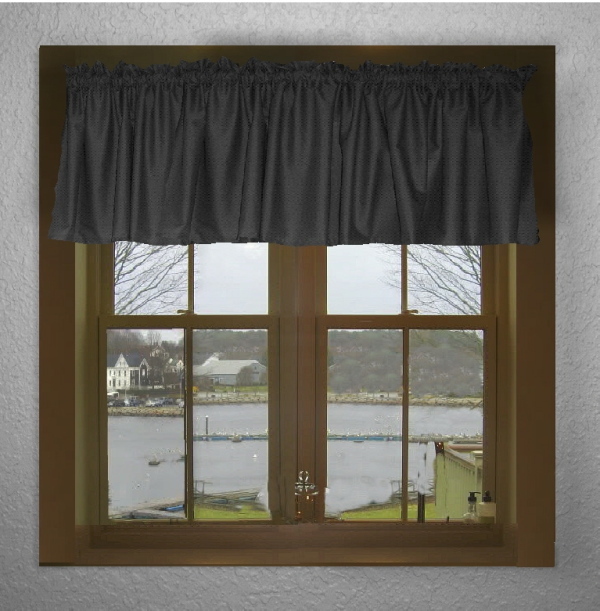 A Valance should be ordered at least 2 times the width of your window, actually 3 times the width is better. This is to achieve the gathered effect of the Valance. If our width offered is not wide enough to achieve the desired look, decorators will order multiple valances. WASHING: lined or Non-Lined valance can be gentle washed and tumbled low or no heat, touch up with low temp iron. NO BLEACH, gentle detergent. Please measure your window correctly. This is a custom sewn product so there is a 30% re-stocking fee plus shipping both ways is your expense in case of a return. Returns in perfect shape only accepted within 30 days of receipt of your curtains.